2 The chart shapes are absolutely identical. If you’ve been following Crypto.BI then you’ve likely seen one of our most popular articles, about fake cryptocurrency market capitalizations. Our main argument is that most cryptocurrencies are not traded for USD, Euros, Yen and vice-versa. Therefore the fiat valuation attributed to these cryptos does not really exist, but is simply a mirror of Bitcoin’s valuation stated in some arbitrary fiat currency (most notably the USD). If you attempted to trade most altcoins for fiat, there would likely be a market crash, because they would need to be traded for Bitcoin before their final fiat conversion. To back this claim up, we took a look at how crypto market caps are actually determined and the propagated throughout the market, the media and so on. The abrupt movements we see on cryptocurrency markets may be related to this “leveraged” market cap. 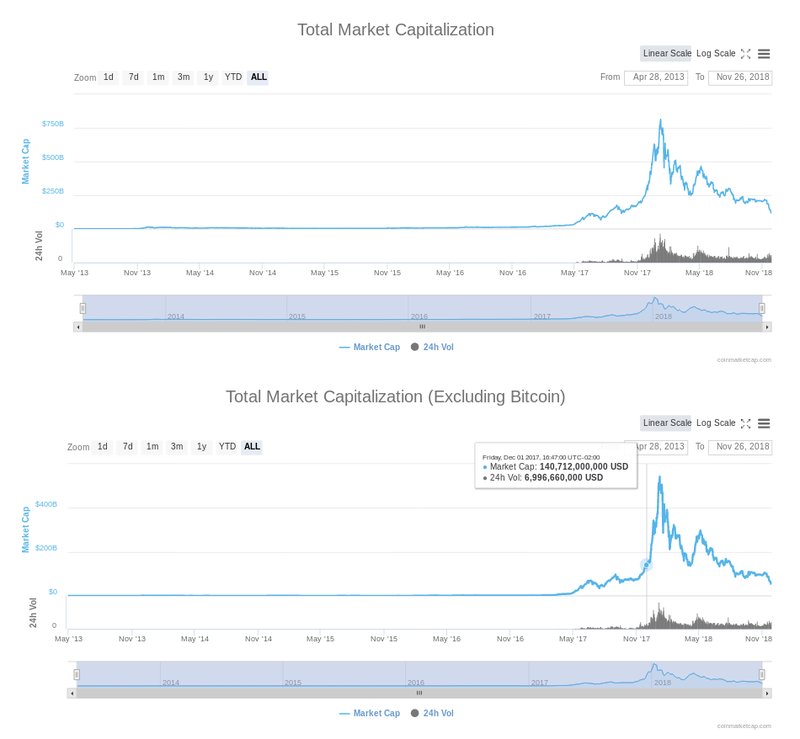 Some technical analysts question why small variations in Tether or some other popular altcoin cause such large oscillations in total crypto market cap. Well, you guessed it. That U$ market cap isn’t really there – it’s fake. It’s like that ghost charge that dead batteries develop. If you measure the battery using a high impedance voltmeter, there’s voltage. But if you try to run any real device using that voltage, it’ll quickly drop to zero. What we see in crypto market cap movements is very similar to a dead battery showing some ghost voltage. In this short article we’d like to present an additional piece of evidence that we feel shows exactly what we described on our first post about fake market caps. The chart at the top shows total cryptocurrency market capitalization. The one at the bottom shows total market cap minus Bitcoin. The chart shapes are absolutely identical. Except for the price scale, of course. And the price scale suggests something very interesting. Note how the top scale is almost precisely twice the altcoin market cap! Bitcoin added to altcoins’ market cap is just over twice the altcoin market caps by themselves! Market caps are counted twice, just like we suggested on our first article from 2017. We suggested that most cryptocurrency market cap was fake during the all time high in crypto prices. It was an unpopular opinion back then. But now, as we gather more and more historical market data, several key pieces of evidence seem to back our initial hypothesis up. The striking correlation, of almost 100%, between altcoin and Bitcoin prices, with almost exactly twice the magnitude on the price scale, is the strongest piece of evidence we’ve found yet that almost 100% of altcoin prices are simply a reflection of Bitcoin price. The U$ value simply isn’t there and this could, in part, explain the wild rollercoaster of crypto prices.